My first experience with shawarma was on vacation on the beach in Tel Aviv, Israel. Food vendors were selling falafel and shawarma sandwiches along with cold beverages on that hot August day. I ordered falafel because it's my favorite street food and my sister-in-law, who was my beach buddy that afternoon, ordered shawarma. I'd never had it before but the aroma was intoxicating and I asked for a taste. Hooked! Just to be clear, shawarma refers to roasted meat, most commonly lamb, that's seasoned and cooked slowly all day on a spit. As the outer layers roast, they're shaved off and served in a pita with vegetables and sauce. But it's that spice blend that creates the heavenly aroma and taste. It's hard to replicate that style of cooking in a home kitchen but it's certainly not hard to replicate the spice blend and I add it to grilled chicken all the time. When I saw that one of my favorite New York restaurants was using shawarma spice on cauliflower, my favorite veggie, I knew I had to do it. And the truth is that I could probably put away a whole head of shawarma cauliflower by myself but, for the sake of argument, let's assume this is four servings. Enjoy! 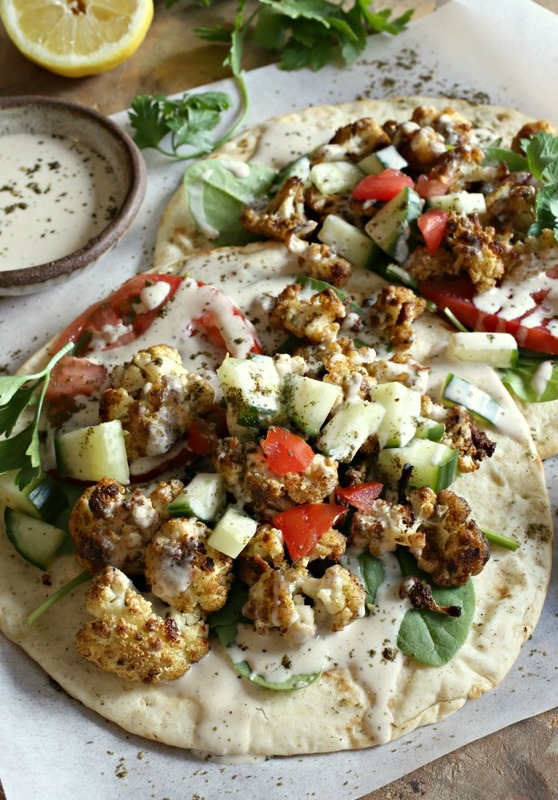 Recipe for cauliflower roasted in shawarma spices and served with pita and tahini sauce. In a large bowl, toss the cauliflower with the olive oil. In a separate bowl, whisk together the flour and all the shawarma spices. Toss the olive oil coated cauliflower with the spices. 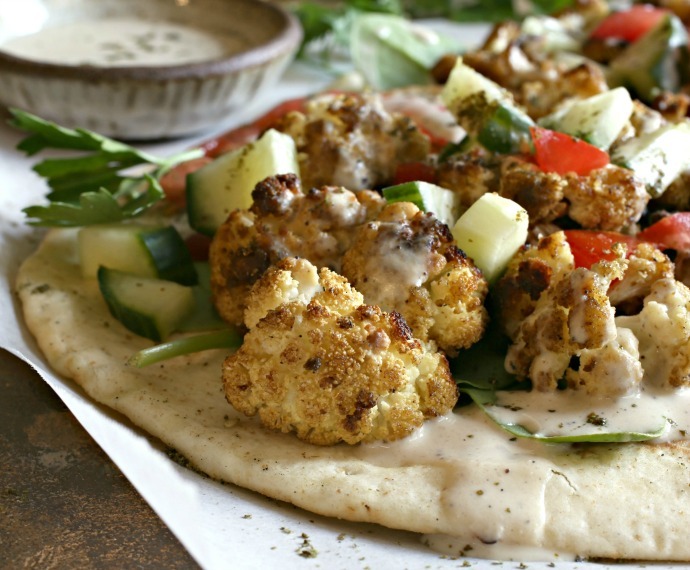 Spread out on a baking sheet lined with parchment paper and roast in the oven for approximately 30 minutes or until the cauliflower is a light golden brown. Make the tahini sauce by whisking together the sesame paste, water, lemon juice, minced garlic, sumac, salt and pepper. 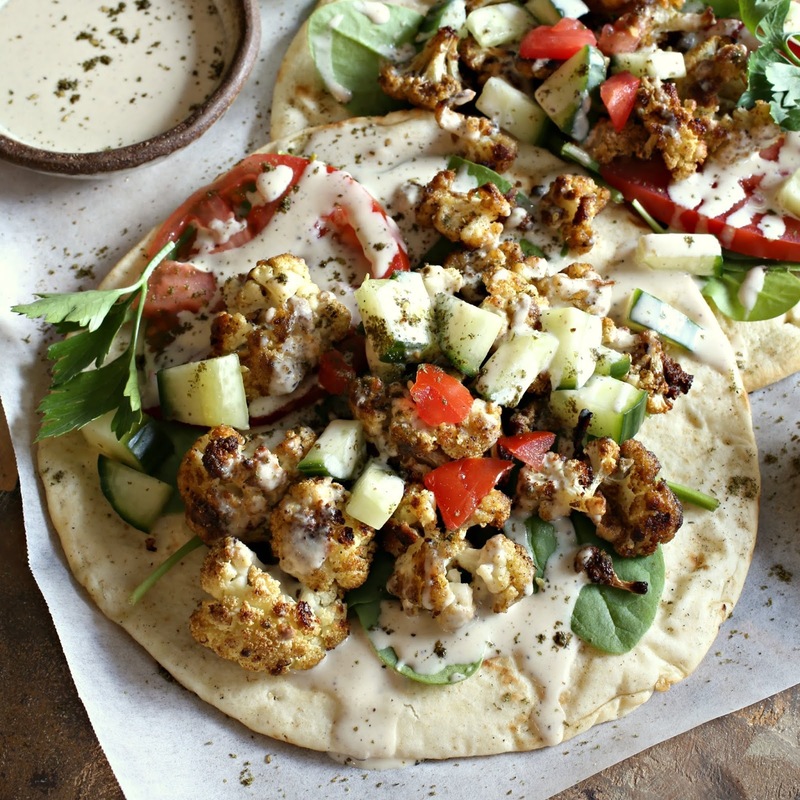 Assemble the sandwiches by placing equal amounts of the lettuce or spinach on the four pitas. Top with the roasted cauliflower, diced tomato and diced cucumber. Drizzle with the tahini sauce and sprinkle on some za'atar, if desired. I am totally on for this. I must make it this week without fail. One of the many things I love about cauliflower is how malleable it is with different cooking methods and flavors. I love love love shawarma. I may quick pickle some onions to go with mine. LOVE this. The recipe is a little bit of an effort since it has so many ingredients. I was hesitant at first to try it. But after I cooked it the results were amazing. I never thought trying cauliflower in the shawarma will give such fine taste. Heartfelt thank you!